The skull of Bujang Senang at the Sarawak Museum (Kuching, Malaysia). 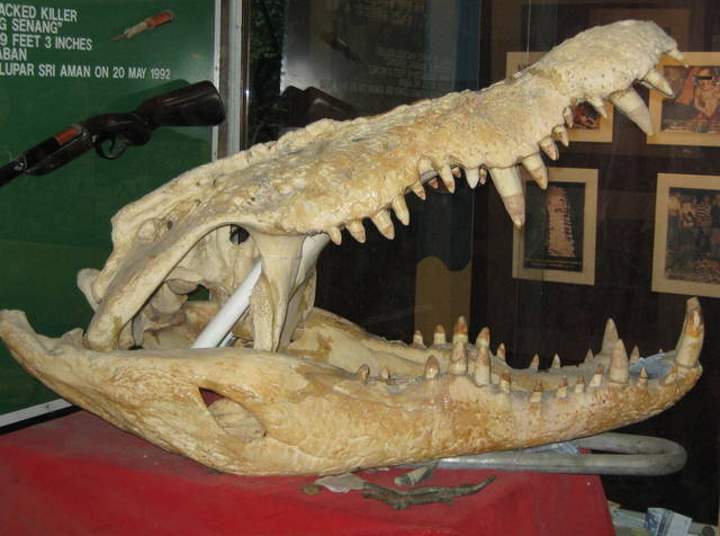 Bujang Senang was a massive saltwater crocodile and it was living in Borneo. According to the local sources, he was a man-eater (some people even claimed that he had been around and killing for at least thirty years). First, he was estimated at 25 feet (7.62 meters). Bujang Senang was killed on May 20, 1992. After the kill, it turned out that his length was overestimated. He was 19 feet 3 inches long (5.88 meters) and weighing over a ton.